Having released Siemens SL55, the company has repeated the experiment in the field of design, in particular, earlier it had released similar model Siemens SL10. Similarity of these devices consists in the identical opening mechanism, the halfs are shifted with respect to each other. 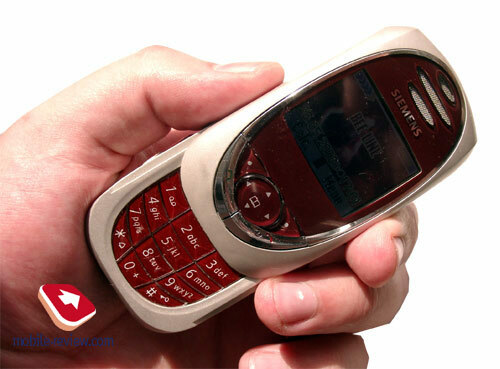 The freshest example of such design is Nokia 7650, some Korean developments. The plus of such decision is compactness of the device, its minimal sizes. In case with Siemens SL55 the compactness is put on the top of the list, the device is extremely small, it lost in hand (82х44х22 mm). The weight of the phone is also minimal (79 grammes), the device practically is not felt in the pocket of shirt or trousers. In opened state Siemens SL55 lays in hand rather good. The oblique form of the case looks interestingly, but compels using two hands at opening of the device, or opening the phone, shifting the top part with the big finger, which lies down on the screen. As result there are constantly traces from hands on the screen. An attempt to adapt to opening the phone in another way has not crowned with success, it's more conveniently opening it in this way. We even have carried out small experiment, showing the phone in opened state, then in closed and asking opening it. The overwhelming majority of interrogated people opened the device, making efforts to the top part, in particular, to the screen. There won't be any mechanical problems at constant opening in this way, the plastic covering the screen is thick enough, the force of pressing isn't transferred to the screen. 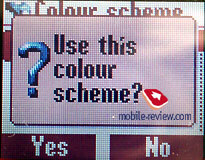 Some words about color variety, the phone's front side can be of ruby color and the keyboard is of the same color. The other part of the case is silvery, in the color decision it is also constant, differ only the keyboard and the fringing of the screen - dark grey. In my opinion, the phone of ruby color will be to woman's liking, men won't use it, and it’s too shouting color. The speaker it is seen through three big horizontal cuts, there is a metal grid inside, it is looked interestingly. And the screen deserves a separate description as it differs from the screen which is fixed in Siemens S55. 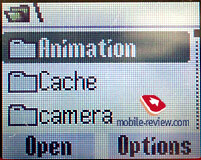 By the sizes it is the full analogue of Siemens' S55 screen (30х23 mm), its resolution is 101х80 pixels. 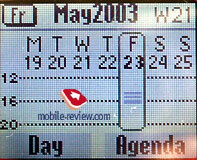 The screen can display up to 5 text lines and one service line. 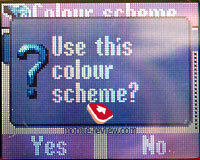 Now it is necessary to note, that it displays up to 4096 colors, while Siemens S55 displays only 256 colors. The screen is looked more brightly, the picture looks little bit better. 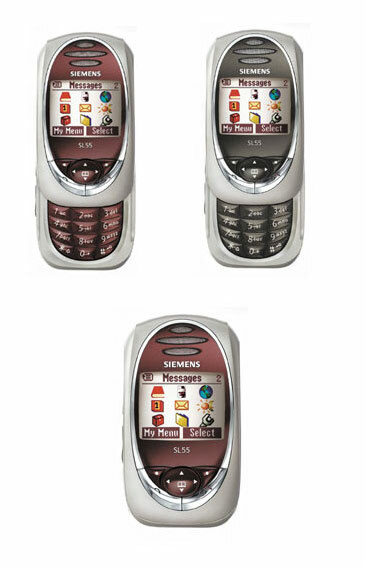 Positive emotions arise at comparison with Siemens S55, an attempt to compare characteristics of this device with fashion phones of Korean manufacturers shows its futility. 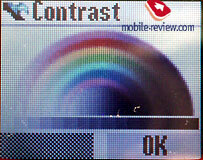 In particular, at present, screens with 4096 colors are not fixed in such devices, at the least, 65000 colors, and since summer the quantity of displayed colors in some products would grow up to 262000. 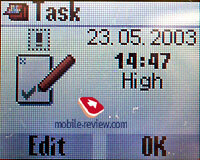 The European manufacturers are not in so good situation, but the same Sony Ericsson T610 has the screen which displays 65000 colors. 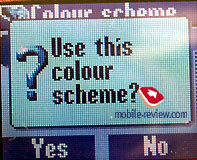 The competition by the quantity of displayed colors Siemens SL55 loses, it is critical parameter for fashion device. 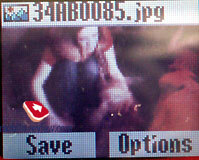 The quality of displaying images on the phone's screen is average, there is rough displaying of picture. In comparison with same Siemens S55 the quality of picture has improved. 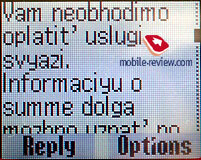 On the sun the picture fades, but it is quite readable, it is plus of the device. By the quality of screen on the sun the phone is quite comparable with model line from Nokia. 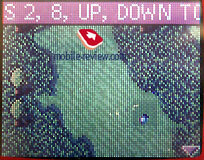 As a whole the comparison of screen's quality is legally with phones from Nokia, on the side of the last ones is only one advantage - larger resolution (128х128 points), in the rest the screens are similar. 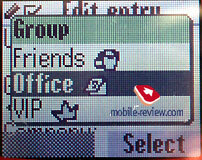 The return impression can be created when viewing icons in Siemens' SL55 menu, but it is not so. 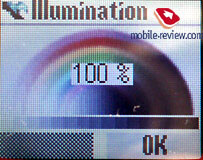 Here the problem, most likely, is that icons are badly drawn, the quality of the screen wasn't to blame. The keyboard is made of plastic, under the screen there is 4-item navigating key, and also two software keys. They are small enough by sizes, but quite comfortable. A minus of the navigating key is that it creaks (not click, exactly the creak of plastic). Pressing upwards is also not so comfortable. Digital keys are located very tightly to each other, they are average by size. In my opinion, to people with big hands the keyboard is inconvenient, though it is to women's and children's taste. In any case the top line of keys is inconvenient because the edge of the case is located too close to them. The digital keyboard has good, equal backlight of white color. The additional difficulty at work with the keyboard consists that when changing from digital to function keys it is necessary to move the finger above, this is the feature of slide design. At the bottom end face there is a system connector, it is standard for 55-line, in particular, for Siemens SL55 matches the cable from S55, however, as well as the software. Accordingly the handsfree set matches to this model from Siemens S55. On the left lateral surface there are two keys, one for dictophone and the other, coupled key of volume adjustment. It is possible to change profiles quickly with its help in standby mode. The side keys are very convenient, it is pleasant working with them. The gap of IR-port has placed on the right lateral surface. Closer to the top end face it is possible to see apertures for a lace. There is a metal insert on the back surface of the device, it is made by aesthetic reasons, it doesn't carry out any function. It is curious, that the accumulator is built - in the back cover in this model, it is easy enough for removing. Here, at accumulator, appears small horizontal backlash as times goes by, it does not affect properties of the device in no way. In this model have applied the lithium-polymeric battery with capacity of 500 mAh. 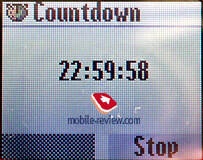 According to the manufacturer the phone is capable to work up to 200 hours in standby mode and up to 210 minutes in talk mode. 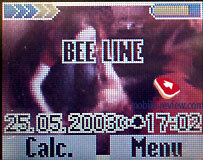 In conditions of Moscow BeeLine network the device worked up to 2 day at 20 minutes of talking and up to 25 minutes of other functions using. 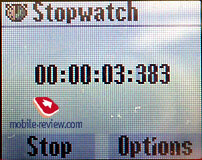 The reduction of additional using time of the phone to 10 minutes allows using it up to 3 days, but no more. It is necessary to pay for the diminutiveness of the phone by small operating time. The time of the full battery’s charge is about 1.5 hour. Some words about the opening mechanism. 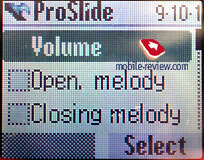 There are some adjustments concerned with device opening in phone's menu, in particular you can switch on the automatic device blocking at its closing, and also to appoint melodies for closing / opening of the phone. The problem consists that in couple of weeks the construction is loosened and there are casual slider operations. I.e. it does not open, but thus the melody starts playing, somewhere is thin contact. It is especially shown if you carry the device in a pocket of jeans. So, in result, I had to disable this function, as I have bothered listening to music constantly and unawaring, whether it is a call or mistake. Finishing the story about phone's construction, I'll note one more potentially weak place. In the opened state from behind it is visible plastic and two fastenings, it is looked not too aesthetically. 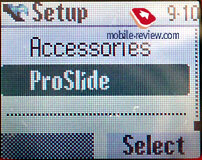 I can recall the generated bad image of Motorola v70, there, from the underside, have applied cheap plastic. The user could not see it , but the associates saw it when the person was talking, here is the same situation. Such trifles play big role in fashion phones. The opportunity to speak in closed state concerns to the category of pleasant trifles, but it is necessary to remember, that in this case the microphone is far enough from your mouth. 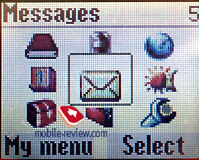 Also it is possible to scroll the menu in closed state, to play games, to read SMS-messages, it is a plus. 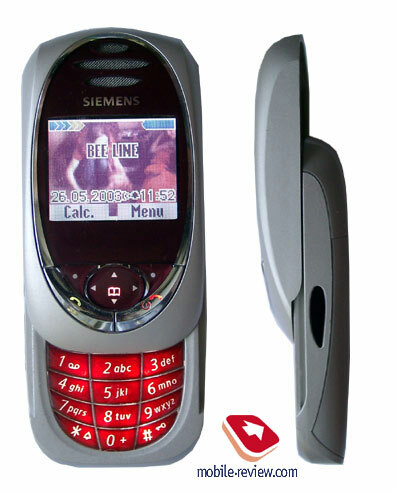 Phone is constructed on the same platform, as Siemens S55, the differences consist in design, less capacious accumulator (of other type besides), screen and absence of bluetooth. The size of dynamic memory became equal to 1.6 Mb, it is a little bit more than earlier. As for the rest the phones are similar, as twin brothers, per se, this is the same device. 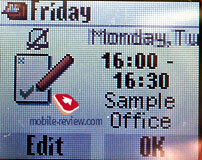 The changes have touched appearance elements, some icons have been drawn again (lists of calls, are designed as the image of this device). 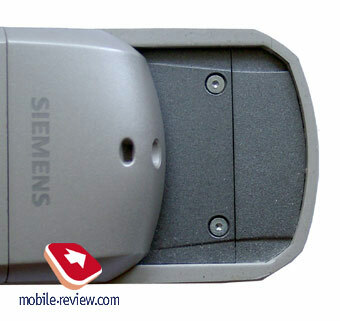 We'll result quotations from Siemens S55 review that you could estimate the functionality of this device. 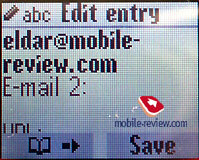 In each name entry it is possible to create the voice labels for individual phone numbers, all them can be up to 20. 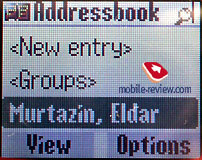 All names can be allocated on 9 groups, it is possible to appoint ring tones for individuals groups. Calls lists. 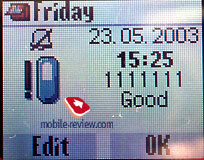 Last 10 dialed, 10 received and 10 missed calls are stored in the phone memory. 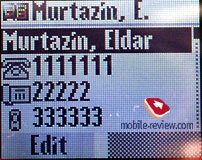 Time and date of each call can be viewed here too. Profiles. 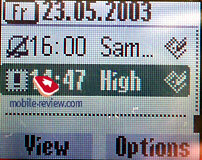 As always you can setup the phone profiles, which allow several settings to be turned on by one key (vibrating alert, type of ringing tone and so on). Organiser. It has traditional structure, there is a monthly view, weekly view (with time scale) and daily view (with time-table). 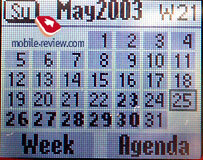 Special menu items allow looking through all special events, for example, meetings, notes and reminders. Totally, up to 500 events can be stored in the organizer memory. World time (time in big cities) could be also viewed here. Besides, one can find a dictophone in this menu, number of records and their duration is limited by free memory space of the phone. Card-Explorer. This utility is used to view data, which are stored in flash memory. The phone has 1.6 Mb of free memory space. Fun & Games. Here we could find wap-browser in version 1.2.1. It was rather disappointing that version 2.0 is not represented here. 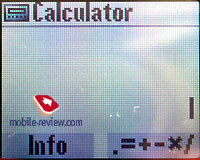 An old version of wap-browser slightly limits functionality of the phone, it’s not possible to view a great amount of web pages. There is no much sense to write about games, they are well-known to everybody. The phone supports Java, so, you can download any games, for example, a puzzle, where you need to create a picture out of several parts. As s picture you can use any photo or image you like. 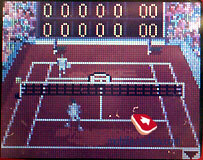 If you wish, you can play tennis. Everything is at your choice. Extra. 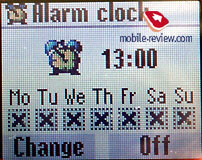 Such applications as calculator, currency converter, stop-watch (with intermediate results), countdown timer, alarm-clock (including recurrent alarm-clock) are located in this menu. Here you also get access to voice commands (up to 10 voice tags). Siemens SL55 supports SyncML that allows you to save all phone notes and contacts on server. Settings. There are all functions, which are connected with phone capabilities. We are not going to describe all of them in details, we'll only make some comments. 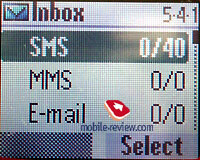 For example, it ‘s better to switch off GPRS when you don’t use this feature, it will increase the autonomy of the phone. Operating time is halved while using this function. IrDa has lesser influence, but it’s more logical to switch it on only while using it. My menu. As always you could create your own menu with the most frequently used features (up to 10 itmes from 27 pre-default ones). 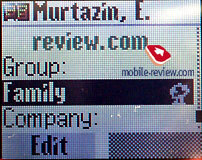 If to say about reception quality, this phone is almost identical to Siemens S55. It's not surprising as these two phones are based on the same platform. The differences are vibrating alert concerned. It is weaker than in Siemens SL55. If compare it with other phones, vibracall of SL55 is weak, but it is felt when you wear the phone in a hostel. The new handset supports 16-tones polyphony (as S55). But volume of the ringer is lower, though there are no reasons to have it. The combination of a low vibrating alert and low polyphony does not allow to wear the phone in a bag. It's better to wear the handset on the belt. One of the shortcomings of the phone is a long downloading of Java-applications, which are optimized for this platform and approved by Siemens. For example, we waited for one minute till one game was downloaded. Then we saw its title and then we had to wait for one minute again before we could download it again. We think that the problems are connected not only with hardware, but software as well. Our experiments showed that S55 worked a little bit faster than SL55, though the difference was not considerable. Unfortunately, Java is not realized well on the phones from Siemens. Probably, they have lack of processing power. Officially Siemens SL55 will be available in July in Russia; the price would be comparable with European rates (about 300 USD). Purchasing this phone, keep in mind that you buy just a fashion solution. By the way, the phone's ergonomics is not the best one. Our impression is that engineers were in a hurry making this handset on the same platform, as Siemens S55 has. 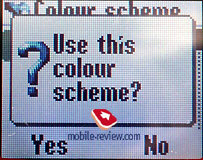 Improved screen is not an advantage of SL55, because rival products of Korean manufacturers are equipped with phones which support up to 65000 colors. In general Siemens SL55 doesn't have any advantages except small dimensions and original opening system. Potential buyers of Siemens SL55 are fans of this trademark. They will buy this handset to their girlfriends and wives. The other target group is young girsl, who pay attention firstly to exterior and then to features, operating time and other things. We think that Siemens SL55 will be a little bit more popular than Siemens CL50. But the company could support sales of this handset. It is one of the most likely outcomes, otherwise, SL55 won't be successfully sold.